Unique! 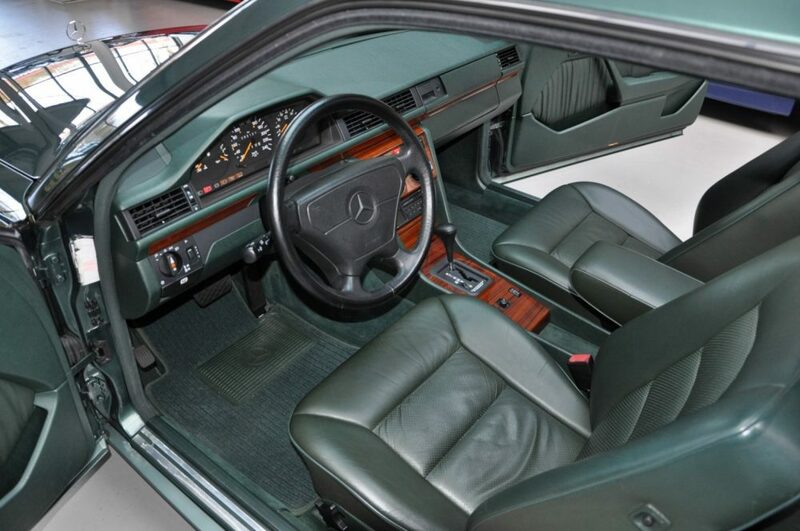 A rare tri-colore; 249 Malachite green metallic with 268 green leather and green dashboard. 3 times the same color! Also very special: demonstrably from the first Belgian owner until 2017. From early to 2017 by the same Mercedes dealer maintained. Original purchase note and a full stamped original service book. This concerns the 220 version that has been delivered very briefly as 220 CE. 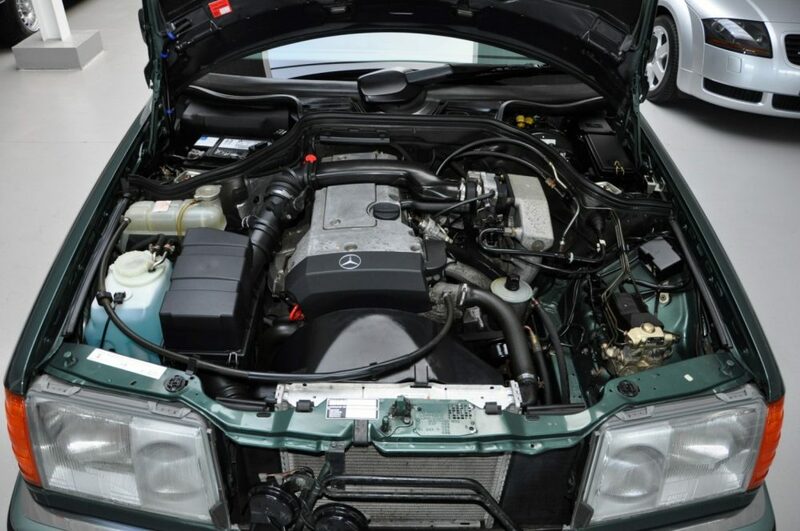 Original only 85.101 km and in excellent condition …. Full disclosure, I love green cars, so needless to say I love this car. 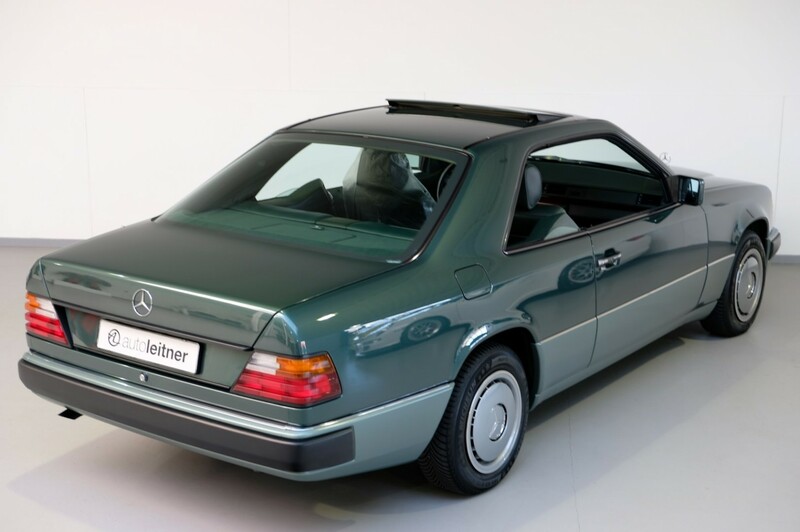 Malachite Green is one of my favorite Mercedes colors, but what I’m really smitten for is the green inside the car. 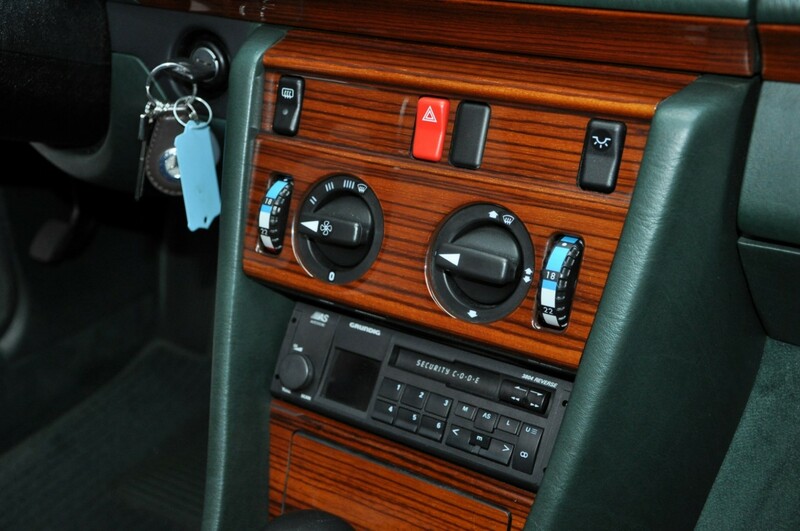 The green dash that matches the green leather seats is so quintessential 1990s and the mint condition Zebrano wood makes it even better. 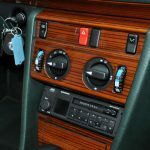 I am not much for aftermarket headunits in any car, but the period-correct Blaupunkt gets a pass from me here. Heading back outside the car, the plastic hubcaps are a neat option that weren’t available on North American W124s and I think they look just fine for the style of what this car is. One thing to note is that this 220CE is wearing winter tires. A little odd for a car with only 53,000 miles and as flawless as this is, but the argument can always be made that winter tires are just as useful for cold temperatures as much as snow and ice, so maybe that is the case here. The price of $15,300 doesn’t really raise an eyebrow from me considering how nice this car is and what this dealer usually has in stock. I featured a pair of 500Es back in February from this same place and they were just as nice as this car, if not better. 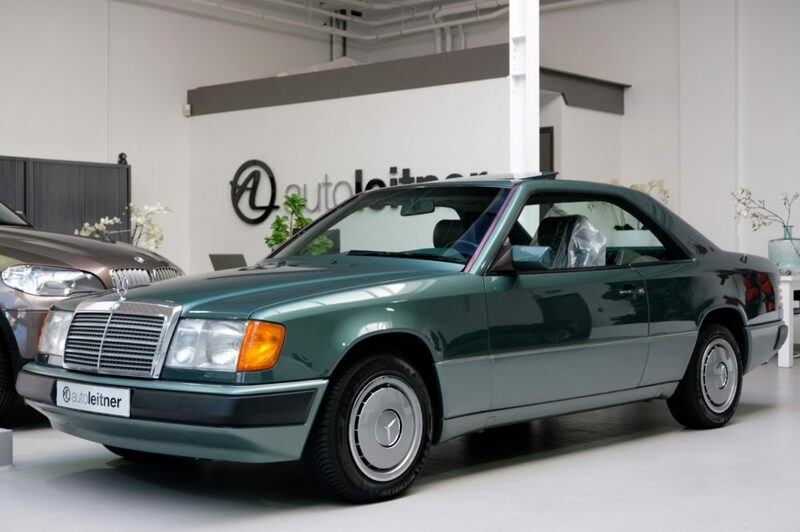 Even though this is a pretty standard C124, the awesome color combo and condition has it primed to be a collectible that can still be driven time to time. Granted, pricey in the grand scheme of things for what this is, but not unexpected. I’m glad I got to check it out. 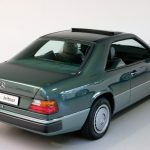 Tagged 1993, 220CE, C124, Coupe, E class, M111, Malachite green metallic, Mercedes Benz, w124. 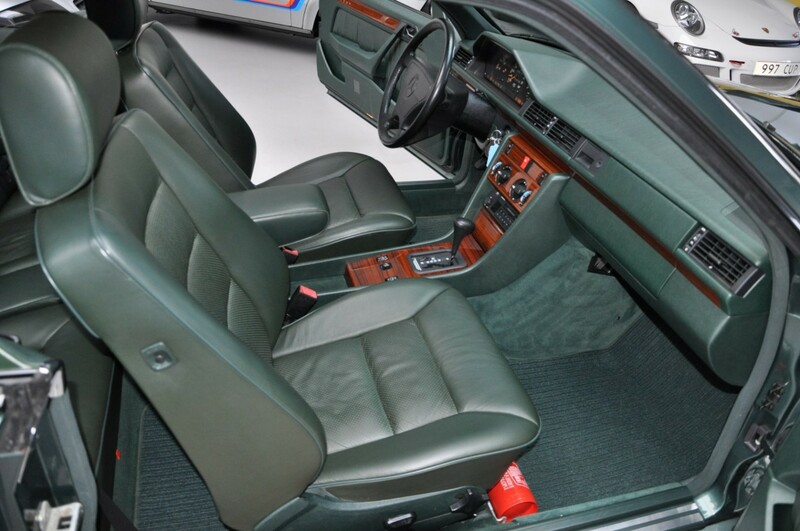 Malachite (spruce) green with matching interior……..Wow. I just love it. 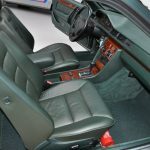 Last year I imported a 1991 230E from Japan in the same color combo, BUT with cloth interior. IMHO, that’s even more stunning. Mine has the factory alloys, but they will be changed soon for steel rims with hubcaps. It will be a keeper forever. Unfortunately this 220CE has no AC, which makes it undesirable for most of the people in the Southern states here in the US. 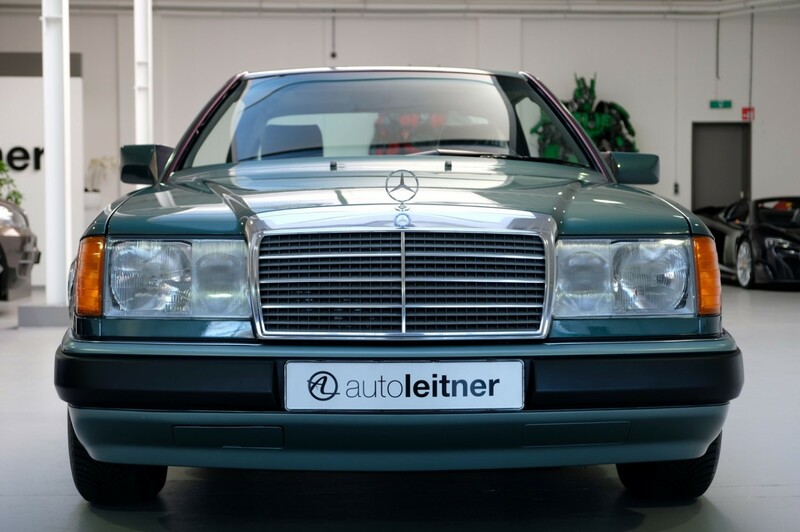 Nevertheless, for the lovers of green cars, like myself, it doesn’t get much better. I love it that the dash matches the seats. Just lovely overall. Beautiful car. Perfect colour combination. 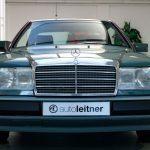 Would you mind reviewing 1993 Mercedes 400sel with 23,201 miles advertised on Hemmings. Before you even give another moment of consideration to that particular car in NY, be sure to do a google check of that dealer’s reputation. And I don’t mean reading the shill reviews. Check the luxury car forums. The body of evidence is significant. Absolutely stunning. But alas, God doesn’t give with two hands. It’s always beauty or brains in humans and the let down here being the noisy,underpowered 4 cylinder. Good mpg? 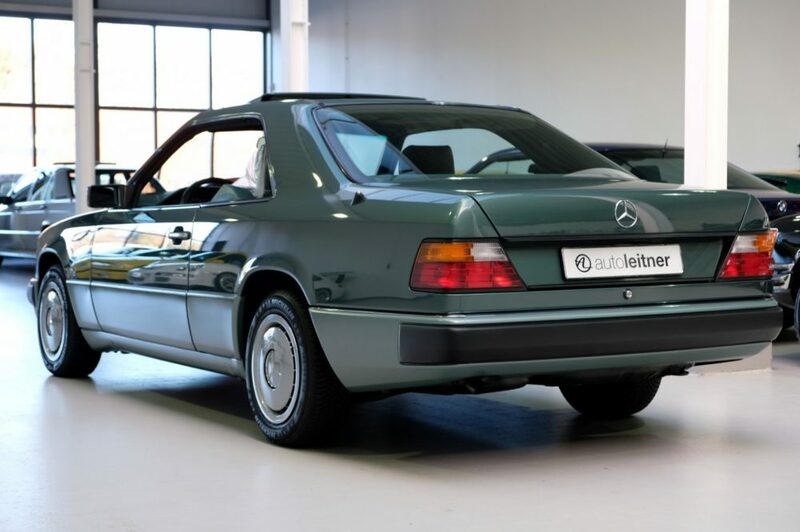 Yes, but picture this exact car with the extra long badge “300CE-24.” Add “Sportline” for good measure.